Buy this item and earn 35 ClubPoints. 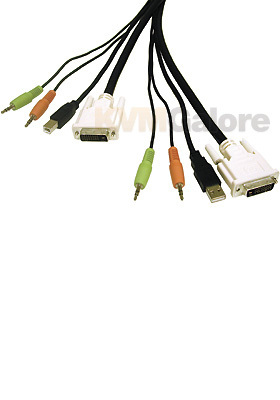 This precision-engineered all-in-one KVM cable is designed to connect your flat panel, speakers, and microphone to your USB/DVI KVM. The DVI-D segment delivers the high-performance, high-bandwidth interface needed for video displays of today while leaving headroom for the products of tomorrow. The DVI-D dual link configuration provides enough bandwidth for resolutions up to 2048x1536, and allows high-speed digital transmission up to 9.9 Gbps. The connectors are color-coded to match the ports on your personal computer or notebook to ensure a simple connection. The black cable jacket disappears behind your desk to leave a clean organized look without the clutter and mess you'll have with ordinary individual extension cables. 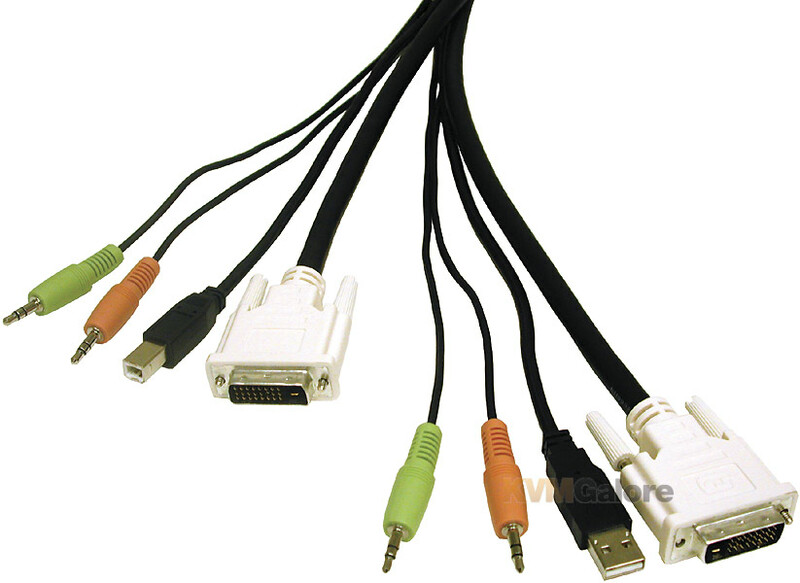 The USB 2.0/DVI KVM cable meets the rigid standards of everyday use. • All-in-one bonded cable design organizes and simplifies cable runs. • Dual link digital signaling allows for high-speed transmission up to 9.9Gbps. • Shielded under-mold protects against unwanted EMI/RFI interference. • Tri-shielding with dual Mylar(R) foil and braid shield reduces interference. • Gold-plated contacts provide full conductivity with no data loss. • Resolutions up to 2048 x 1536. • PC-99 color-coded connectors for easy installation. • DVI-D supports digital signal only.